The Ruff Ceilidhs also known as Heath Ceilidhs are held in the recreation hall at the CMC Sports and Social Club on the campus of the University Hospital of Wales, Heath Park, Cardiff, CF14 4XW. Everyone is welcome. You absolutely do not have to join the Club. 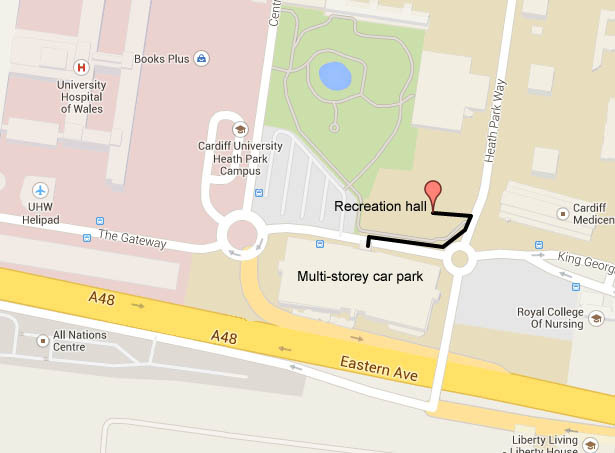 The main hospital multi-storey car park is just a stone’s throw away. Parking for up to 4 hours is now FREE. NB. If you are staying for a minute longer than 4 hours be sure to log your registration number with the Parking Eye system or else you will get a penalty fine.